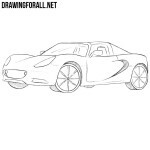 Hello everybody and welcome to drawing tutorial on how to draw a Hennessey Venom GT step by step. As you know it is a sport car of the American tuning company Hennessey Performance Engineering, produced from 2010 to 2016. The car is based on the Lotus Exige body base using the LS9 engine from the Chevrolet Corvette ZR1. A total of twelve copies were produced: six coupes and six roadsters. The first thing we need to sketch out general outlines of our car. Use light and smooth lines for this step. 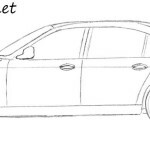 In the upper part sketch out the windows of the car and at the bottom sketch out wheel arches and the wheels themselves. So, let’s start adding details. 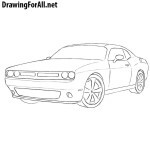 With the help of very smooth lines draw out the hood and extended headlights. Further we go down and draw out the radiator grille, bumper and antifog headlights. Draw lines of the roof, windows and mirrors. At the top of the roof draw out the air intake. 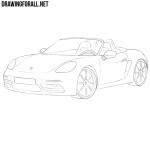 We go down a little lower and draw out the details on the side of our sports car. 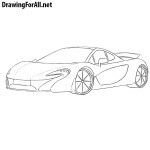 So, we reached the last step in the lesson about how to draw Hennessey Venom GT. In this step we need to draw out the wheels and rims. So, what do you think about this drawing lesson? Did it help you learn how to draw a sport car or not? We really need your comments and suggestions, so feel free and write what you think about this and other our drawing tutorials.